In order to learn 5 ball juggling, it is assumed you can already juggle a very good 3 ball cascade pattern and do quite a few tricks. It is not essential that you have learned 4 ball juggling as odd numbers of balls are juggled differently than even numbers, but there are several 4 ball tricks that can help you to learn 5 ball juggling. If you can’t 3 ball juggle, then please visit my 3 ball cascade page. 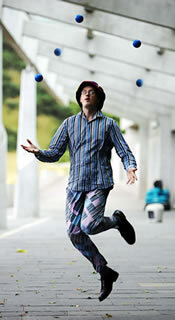 If you would like to learn 4 ball juggling, then please visit my 4 ball juggling tricks page. I have been juggling 3 balls since CHRISTmas 1993, but after many years of trying to learn 5 ball juggling, it was only once I put in some solid practice that I finally mastered the trick in August 2005! Please note that I use the terms favoured hand and weaker hand instead of mentioning left and right hands. This makes it easier for left handed people (including myself) especially to understand these tricks! What Does This Pattern Look Like? The actual 5 ball cascade is the same pattern as the 3 ball cascade, only it is higher and a lot faster! This may sound quite simple, but bear in mind that in the cascade, the balls pass through the same central point, and therefore if your timing or accuracy is slightly off, then the balls are more likely to collide! Find Other Advice When researching how to do 5 ball juggling, everyone seems to have their own opinions as to which tricks and techniques are best. The advice I offer here is one possible way to learn to 5 ball juggling, but feel try other peoples advice also! 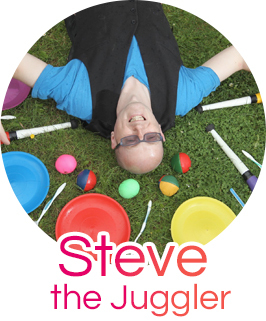 Contact me to find out where your nearest juggling club or conventions are as it is best to learn from another person who can help you to improve with regular encouragement, than to learn by yourself! Don’t Give Up 3 ball cascade and 4 ball juggling may have took you just a few days/weeks to master, but 5 ball juggling will take you much longer, so don €™t give up! Learn 3 and 4 Ball Tricks Try learning every trick on this page as there are some good 3 and 4 ball juggling patterns which will help you to master 5 ball juggling, but they are excellent tricks anyway! What Height Should I Throw To? This is a trade off, as you will know from juggling 3 balls that the lower you can throw, the more accurate a pattern you have, but the less time you have to make each throw, and vice versa. Some people suggest that you should throw to the height that is as high as you can reach when you are on tip-toes. The choice is yours! How to Hold 3 Balls in one Hand I juggle 5 x skwoshballs, so I can scrunch them up slightly so they fit comfortably in my hand in a flat triangular shape. This is a personal preference, and you will find that 5 ball jugglers all have their own favourite type of juggling ball and favourite method of holding 3 balls, so experiment a little until you find a method that works for you! Which Balls do I Recommend? Do not use large juggling balls (eg stage balls), as you need to be able to hold 3 balls comfortably in one hand. For this reason, a skwoshball can be a good purchase, as they can be squeezed together to fit better in your hand. You could use beanbags which are triangular in shape and would therefore take up even less room. Beanbags would also have the advantage of not rolling when they are dropped onto the floor! Practice these 3 and 4 ball Tricks first! There are several 3 ball and 4 ball tricks that I recommend practicing, which will help you with learning to juggle 5 balls. Of course nothing beats just picking up 5 balls and giving it a try, but these tricks are useful in helping you to increase your juggling speed, height, accuracy and improve your timing, which are all essential skills for improving your 5 ball juggling, so please give these tricks a try! In any 5 ball practice session, probably best to pick a couple of these tricks and maybe one 4 ball trick and plenty of 5 ball practice, rather than just concentrating on one trick. This may keep you from getting frustrated and it will also help expand your 3 and 4 ball juggling routines! 3 Ball Cascade (High) Practice throwing every ball to a 5 ball height and get the height consistent with every throw. Hands Down to Knees Juggle a 3 ball cascade but bring your hand down to below your knees before throwing the ball high. 3 Ball Shower One hand throws high to the other hand, which passes to the first. In essence, one hand does all the throws, and the other hand makes all the catches. The balls travel in one direction (a kind of triangle). To begin with, just use two balls. Have them both in your favoured hand, and throw them high and quickly (one after the other). As soon as one ball lands in your weaker hand, pass it horizontally to your dominant hand. When you feel ready to try three, remember that this will take a lot of practice to look smooth. Remember to throw high and accurately, as you don’t have time to chase balls! Try to do a high shower pattern and keep the pattern smooth and accurate, and please practice this in both directions! 3 Ball Flash While doing a cascade, throw all 3 balls high, and then continue. This trick will help you get used to the speed and the height of the 5 ball cascade! Flash With Handclaps Do a 3 ball flash (see above), and as soon as you have released the third ball, clap your hand once. Now try again but this time clap your hands twice before continuing the cascade. These 2 claps would represent the 4th and 5th balls being thrown in a cascade pattern, so it is a very useful trick. Try doing this trick continuously. Juggling the Baby Start with 2 balls in your favoured hand and one ball in your weaker hand. Throw 2 balls from the favoured hand in a shower pattern, then toss the ball from your other hand straight across to your favoured hand. Now throw the 2 balls in the shower pattern back towards your favoured hand and throw the single ball straight across to your weaker hand. This trick is called holding the baby, because this is how you would juggle a real baby (the baby being the single ball that would be passed carefully using the arm as a cradle, straight across from one hand to the other!) PLEASE DO NOT JUGGLE A REAL BABY THOUGH! Learnsome or all of these tricks, then try some 5 ball juggling. Learning these tricks will help make it easier! Half Shower If you are able to 3 Ball Shower (see above), then this trick should be simple enough once you are comfortable with 4 ball juggling. You can start off by juggling this pattern synchronously (throwing a ball from each hand at the same time). Choose which direction you want the balls to go in, and at the same time throw a ball high to one hand, and throw the ball low to the other hand. When both balls peak (which should be roughly the same time – needs a bit of work), then throw the next two balls in exactly the same way (the hand that threw a high ball, throws another high ball etc). Keep going, and practice this trick in both directions! Snake Start with two balls in each hand. Throw one ball from your favoured hand, then two balls from your weaker hand in quick succession. Then throw two from your favoured hand in succession. (i.e. throw the one still in your hand, catch the first left, throw it, catch and hold the second left) Then two lefts, two rights, two lefts, etc. It’s confusing at first, but the pattern looks really good! Improve your Accuracy Throw the 5 balls and let them drop again. Look at where they have landed. They should have landed roughly in a clump of 2 near each other and 3 balls near each other. Improve your Timing Try throwing all 5 balls up in the air and letting them drop to the ground. Listen to the sound that these 5 balls make when they each hit the ground and try to get a nice even rhythm for the drops. This will mean that your pattern is evenly spaced out. 5 Ball Flash This is 5 throws followed by 5 catches. The 3 balls from your favoured hand should end up in your weaker hand, and the 2 balls from your weaker hand should end up in your favoured hand. You may find that it is your third or fourth throw that is consistently off in the same manner each time and therefore this trick gives you the chance to concentrate on just improving that particular throw. Stand Near a Wall “What really helped me is when I practiced against a wall. Since the balls touched a little bit of the wall, their pattern was easier to make.” (tip from Jean-Claude Villemaire – Canada). If the pattern gets too wide This tends to happen when you don’t have enough time to bring the hands back towards the centre of your body to make the next throw. Try throwing a little higher to give yourself some extra time to return your hand to its proper throwing position. I can manage €œ10+€ throws and then can€™t get any further! Try a few 5 ball flashes (5 throws and 5 catches). Aim for accuracy, and getting the timing improved. Now try to get 10 clean throws and catches and stop. If you can keep the first 10 throws and catches clean, then there is no reason why you shouldn’t be able to keep going with a bit of practice! It may be helpful to stop trying to count the balls as this may be taking up too much of your thinking! The pattern seems way too fast! One way to make 5 ball juggling seem slower is to try flashing a 7 ball cascade! After a few attempts and the realisation that you have to be even more faster and accurate, your 5 ball pattern will seem a lot slower than before. Trust me, this actually works! You only need 3 repetitions of 5 balls to be classified as a 5 ball juggler (15 catches), so keep practicing!